This guide will show you how to remove the bearing (C4-5 10x26 BEARING) from the clutch plate (C4-11 CLUTCH PLATE BRACKET) in your Evo transmission. If you are planning on switching out the bearing in your clutch plate for a new one, removing this little beast is no easy task—especially if you are like me and don't have access to a proper workbench. I have found a simple, straightforward way that you can remove this bearing safely using only an Allen wrench and other parts from your Evo transmission. OK… so first things first, you are going to have to disassemble the transmission and free the clutch plate to work with. 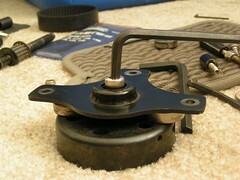 Take your clutch bell and a couple of the old bearings and set them up like the picture below. 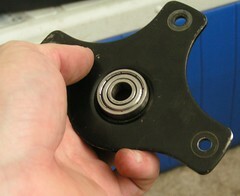 The bearings in the picture below are the 6001's that are in the cams of the top of the transmission. I am using them because they are stable under pressure and are about the right height for later, but you could use a few of lock-nuts or something. Lay your clutch plate on top of the clutch bell and bearings as show below and gather the large bolt which runs in the shaft opposite the clutch (C4-9 SIDE PLATE ENGINE BULT) along with the washer which would normally ride between the clutch bell and the bearing we are pushing out. Before you put the bolt and washer in to the clutch place, get down and make sure that the bearings separating the clutch plate and clutch bell will not obstruct the bearing while we are pushing it out. 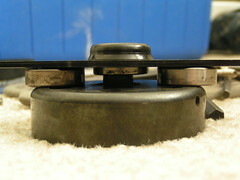 In this picture it is easy to see that they are far enough to the sides since my bearing is sticking out, but it may be more difficult for you to see since yours should be flush. 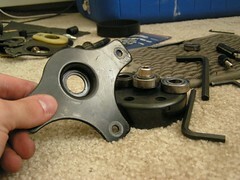 Now screw that bolt and washer in through the top of the clutch plate and into the clutch bell. This bolt is not very long, but it should reach enough to grab. If you can only get one thread on the end of the bolt to grab, find something a little shorter than the bearings to place in between the clutch plate and clutch bell. CAUTION: It is very important that enough threads make it into the clutch bell. 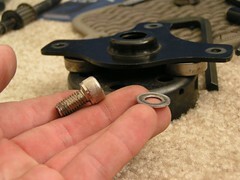 If the bolt does not catch enough threads you could strip it or the clutch bell. 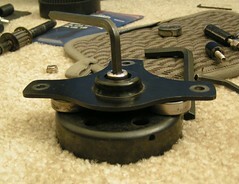 Now, tighten the bolt into the clutch bell. 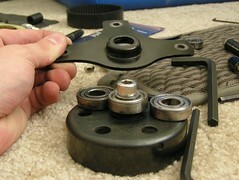 As you turn, the bearing should be being pressed out of the clutch plate by the bolt and washer. Most likely, your tightening won't pull the bearing completely out, but it should pull it far enough for you to free with your hands by pushing the clutch plate away from the clutch bell. Make sure to clean your clutch plate carefully before you press the new bearing in to ensure that it sticks just like the last one did.